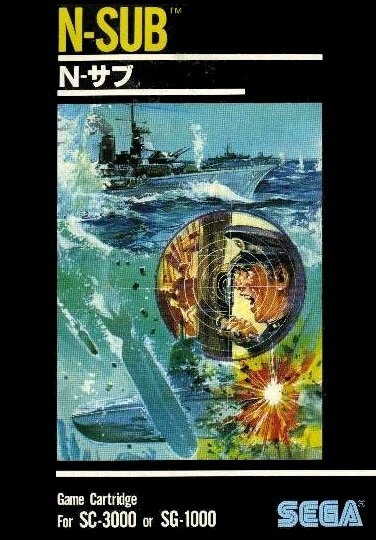 N-Sub‘s cover makes the game look like a tactical underwater adventure. Nothing could be further from the truth. N-Sub is an inconsequential arcade port that feels antiquated next to the likes of Borderline or even Safari Hunting. You control a presumably renegade submarine who has to fend off entire countries’ naval fleets, both above and under the ocean. Your sub can fire torpedoes horizontally at other no-good subs or shoot torpedoes above the water at speedboats and frigates passing by. To proceed to the next level, you’ll have to destroy two waves of six frigates and one wave of enemy “destroyers.” The ships travel slowly from the right side of the screen to the left and make it rain confetti bombs down on you (a ticker-tape parade of death). Due to their take-it-easy attitude, the ships are easy to take out. The destroyers, however, move quickly and travel in loops, making them harder to hit. As you’re attempting to level the navy, the occasional atomic bomb will drop from the sky, and speedboats will pass by with additional confetti blasts. Avoid the distractions, blow up those who oppose you, and proceed to the next round. Unfortunately, there are no cowboys riding the atomic bombs. Subsequent N-Sub rounds become more challenging, but there’s surprisingly little variety to the levels. That is to say, no variety. Blow up ships, watch out for other ships, then repeat in a vicious cycle of the damned. Borderline‘s intermingling of genres didn’t work, but it signified ambition. Safari Hunting confused hunting and capturing exotic animals with entertainment, but there was a smidgen of depth in its madness. N-Sub is one note, unremarkable, inexcusable blah that I couldn’t stop playing because I couldn’t believe the same monotonous gameplay could be dragged out across an entire game. There is little difference between the arcade version of N-Sub and the SG-1000 port. The difficulty for both is about the same, and your submarine moves about as quickly. The enemy fleets haul ship a bit faster in the arcade version, but that’s the only significant difference. Well, that and the shrill sound effects the SG-1000 version adds. Like the arcade versions of Borderline and Safari Hunting, arcade N-Sub forces you to play in sweet, blessed silence, and the game’s all the better for it. Regardless of which company ripped off the other’s product, there’s a reason neither of these games are remembered today. I like the eerie night atmosphere in HeliFire compared to Sega’s bland blue afternoon in N-Sub, but the gameplay is incredibly similar, right down to the confetti bombs. And really, one tedious submarine shooter is enough. Shame on the Nintendo or Sega operative who thought this was an idea worth stealing. So those were the system’s launch titles eh? An okay military game, a weird hunting game, and a boring sub game. You were right, pretty weaksauce. Yeah, nothing to write home about. You do have to love 1980s game covers though and all their promise. Indeed. That goes without saying. What’s weird is the Sega 1988 in the screenshot. Wonder if that is the European version? 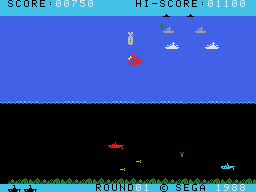 The more I see of these games , the more this reminds me if the Colecovision. Except with older Japanese games we never saw on US consoles. Had I played this in 1983 I would have been somewhat impressed knowing nothing about the Famicom. I was still playing Atari 2600. I no next to nothing about this library though outside of maybe 3 games. So it’s interesting to read but probrably not play. I wondered what the deal was with ‘1988’ in the screenshot, as well. Yeah, my first frame of reference for gaming was the NES and C64; Atari/Colecovision were a few years before my time. I don’t think that’s why I have a hard time appreciating these games, though. They’re just… lacking. The only games I kind of know about for The SG-1000 are they had a decent version of Zaxxon I think? And a Wonderboy which is a good game except the SG-1000 version does single screen scrolling. And of course Girls garden since it was Yuji Nakas first game. I’m kind of looking forward to the racing games as that’s something Sega has always done well. Plus they had a cool analog racing controller the with throttle I never knew about until reading this blog. This is great because the SG-1000 is practically undocumented anywhere as far as I can tell. So I am greatly enjoying this. Regardless if the games are bad so far. Thanks Robb! Glad to know you’re tagging along! This looks _very_ similar to Seafox, released in about 1981 for the US 8-bit computers (Apple II, C64, Atari PC). I loved Seafox and still do, although it slows down a lot more than I remember. I wonder how the two games differ. It would not surprise me if Sega was inspired by Seafox.